British police arrested a 10th suspect in the terrorist beheading of a soldier while they struggled to prevent a bloody clash between 1,000 anti-Muslim ultranationalists and their opponents in the heart of London. The latest suspect was described only as a 50-year-old man seized in Welling, east of London, on suspicion of taking part in a plot to attack and dismember 25-year-old British soldier Lee Rigby last week. 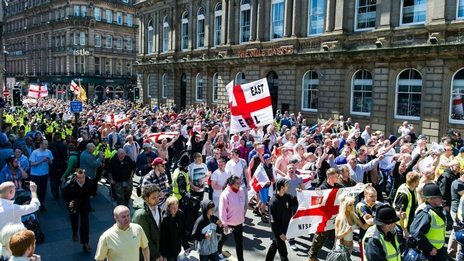 The arrest was disclosed as beer-swilling supporters of the extreme right-wing English Defense League, chanting anti-Muslim slogans, marched from Trafalgar Square to Prime Minister David Cameron’s Downing Street office. “They’ve had their Arab spring. This is time for the English spring,” Tommy Robinson, a leader of the group, told them. What's happening now in London is the COMING ATTRACTIONS for this country. Only in Their case, the problem has had years to establish and fester and it may be to late to change.